To be more precise, it is a way for kids to write some of their own math problems using a deck of cards. 😃 But it can definitely FEEL like a game for little ones! 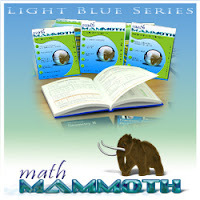 Math Mammoth THANKSGIVING sale is here! Get 25% off of all the downloads/CDs sold at MathMammoth.com site! Use the coupon code THANKS2017. The offer is valid till December 3, 2017.